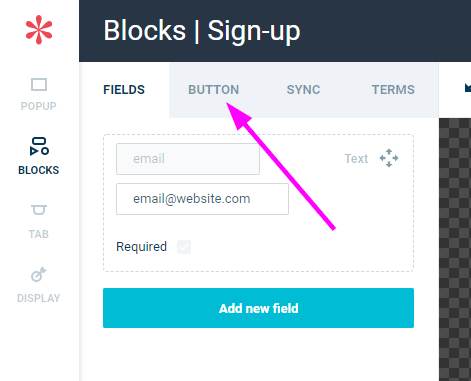 You can choose to display a custom post sign-up message to display coupons or download links that will appear in the same place as your sign up block when your visitors sign up. Step 1: Open your popup. Step 2: Roll on your Signup Block and click on it. Step 3: In the left menu, select "Button"
Step 4: Select "Display a thank you message" in the drop-down menu. 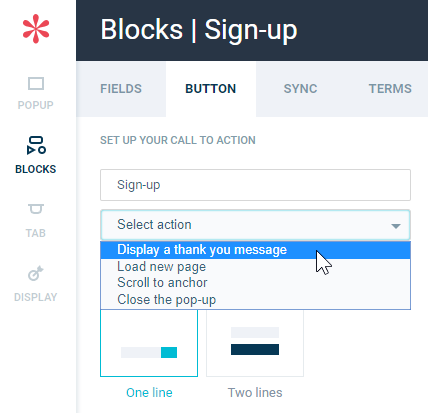 Step 5: Click the "Thank you" call-to-action that appeared at the top of the screen. Step 6: Insert your message or coupon and save your changes.